It is astonishing to me that one could still be excited by so venerable a text as Seneca’s Oedipus. Such was the case with my encounter with Michael Rutenberg’s rendition of this masterwork. Highly imaginative, eminently actable, and obviously a work of fine scholarship and devotion. It is my hope that it will be performed in theatres worldwide. The translation itself is admirably fluent and contemporary in idiom. It should be very effective as a vehicle for performances and should be easily comprehensible to audiences whether they hear or read it. 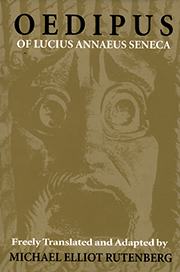 Rutenberg’s translation and the discussion he provides on staging the play in his introduction facilitate the possibility of an exciting stage performance of Seneca’s play. Michael Rutenberg’s Oedipus is a skilled, shattering translation of one of the most haunting dramas of the Roman corpus. I have watched Rutenberg’s text leap form page to stage and reclaim there in its native habitat a dark, elemental, utterly compelling energy. As an added bonus, his learned and illuminating introduction casts appreciated light into even the corners of this often overlooked masterpiece.